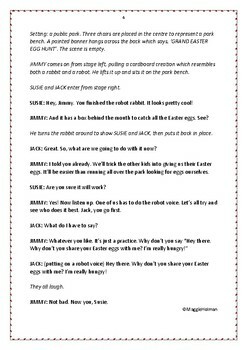 In this short comedy script for 2nd and 3rd graders, Jimmy, Susie and Jack can't be bothered to take part in the Easter egg hunt in the park. Instead, they build a robot rabbit and try to trick other children into handing over their Easter eggs. Jimmy puts on a funny robot voice and pretends the rabbit can speak. It's all going well until the park attendant discovers their trick. The play lasts approximately 8-10 minutes. 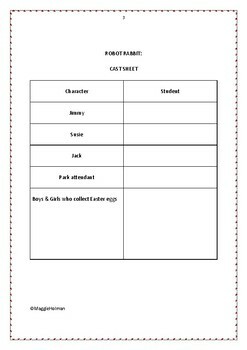 The script has a cast of 8 characters: Jimmy, Susie, Jack, the park attendant and 4 children who are taking part in the egg hunt and have speaking parts. 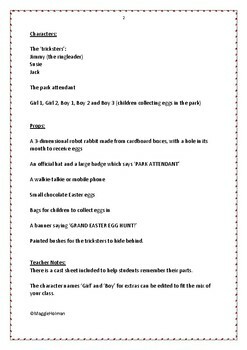 The script can be modified to include extra egg hunters if appropriate. Some painted props are required: the robot rabbit, an 'egg hunt' sign, a 'park attendant' badge and some bushes for the tricksters to hide behind. The making of these props can be allocated to other children while the cast rehearse, and so the production becomes a team effort. Taking part in drama has lots of social benefits for students. They learn collaborative, cooperative and creative skills, and they experience being part of a team. 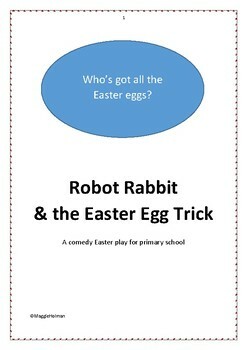 This short play will give them a fun drama activity in the lead-up to Easter.